Do the Sennheiser RS 180 Open Digital Wireless Headphones live up to their price? How much are you willing to spend on a set of headphones? Temper that figure with the following facts: the headphones are wireless, and broadcast on a high-resolution RF frequency for maximum quality without wires. This is a perfect form factor for use with a desktop PC – you'll never get the cable mangled by the wheel of your chair. They're also super-comfortable, clad in velvety fabric, and they nestle on your head like a creature designed to secretly consume the brain. They can pump out bass like nobody's business, ripping through your music and giving vocal recordings that extra warm edge. Basically, they're everything you want a pair of headphones to be. But look over there at the price. We're pretty sure that wasn't the sort of figure you had in mind. 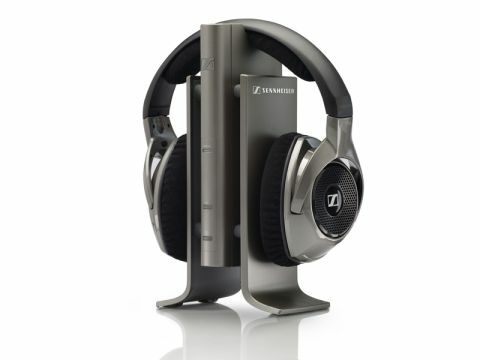 Besides the wallet-emptying cost, Sennheiser's RS 180 headphones have other bad points. Battery life, provided by a pair of rechargeable AAAs slipped under each ear cup, is around six hours. This is perfectly respectable in use, but still short enough that a night left off charge means a few irritating hours of silence while you fill them up again. They're a little leaky with the sound, so you'll struggle to get away with loud music in a shared environment. We also noticed a minute amount of subtle distortion in the signal, possibly due to wireless interference over the radio link, so you'll want proper wired headphones if you're after the absolute highest quality possible. Perhaps most irritatingly of all, the charging points – located in the centre of the headband – have been designed in such a way that they grab and pull at your neck hair if you deign to rest them on your shoulders when not in use. That's really not a pleasant experience. Weigh it up. The combined mass of the ludicrous price and multiple niggles doesn't quite balance with the truly great points these cans possess. We'd happily use them, but there's no way we'd buy them over a cheaper wired pair that would sweep away all of the bad points and only one of the benefits.